The Frigidaire FFAD5033R1 Energy Star 50-pint Dehumidifier protects your home from mold and mildew caused by excess moisture. It also helps eliminate bacteria in the air that can make breathing difficult. Frigidaire's 50 pints-per-day dehumidifier is capable of continuous operation when the unit is located near a suitable drain. Ready-Select electronic controls include a digital humidity readout, 24-hour on/off timer and control lock. Effortless Humidity Control allows you to control the exact percentage of humidity in your room. The Space Wise portable design includes a top handle, integrated side handles and caster wheels making it easy to move your unit from room to room. Plus, you'll save money with its Energy Star efficiency. Effortless™ Humidity Control- This feature allows you to control the exact amount of humidity in your room to increase your indoor comfort. Effortless™ Full Tank Alert System - This system alerts you when the water tank nears capacity and it's time to empty. This helps protect against damaging overflows. Effortless™ Automatic Shutoff - With this feature, the dehumidifier shuts off automatically when the water tank is nearly, saving energy and protecting against spills. Effortless™ Continuous Drain Option - This feature is a continuous gravity drain system. Simply connect a dehumidifier drain hose or standard garden hose to set up continuous drainage to a nearby drain. No intervention needed! 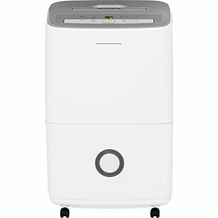 Effortless™ Clean Filter - The dehumidifier also features a removable washable filter that reduces bacteria, room odors, and other airborne particles to sustain the unit's high efficiency and clean the air in your environment. These features and functions take the confusion out of daily operation. You can maintain your home's optimal humidity with ease and get back to your daily activities faster. Areas throughout your home can often be affected by high humidity. Thankfully, the Frigidaire FFAD5033R1 is portable. Thanks to its Spacewise® design, you can easily move the unit to treat multiple areas in your home. Easy-rolling casters and top and side handles help you move the unit from spot to spot. Plus, you have 2 draining methods to choose from: manual and continuous. Choose the right method for the space. 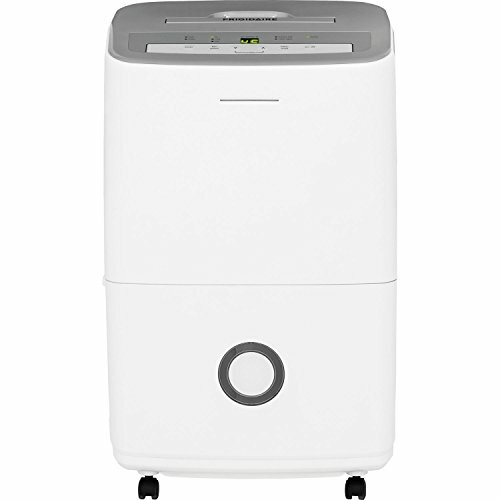 You'll also appreciate this dehumidifier's simple and sleek design. No more eyesores! 3 Dehumidifying Speeds - Choose from low, medium, or high to suit your comfort needs. Humidistat or Continuous Mode - Set your desired humidity for the unit to maintain when using humidistat mode. You can also run the dehumidifier continuously when you need to bring down high humidity levels fast. Manual or Gravity Drainage - You can drain the dehumidifier manually by emptying the bucket or via gravity by attaching a garden hose to the included drain adapter. Delay On/Off Timer - Use the timer to program the dehumidifier to turn on or off up to 24 hours in advance. Automatic Defrost - Auto defrost automatically melts frost buildup so the unit can continue removing moisture in low temperatures down to 41 degrees F. Loss of Power Protection with Auto Restart - If power unexpectedly goes out, this function saves your programmed settings. When power returns, the dehumidifier automatically restarts with those settings. Extra-Long Power Cord - Makes extension cords unnecessary. Plus, there's a handy cord wrap for storage. Energy Star-Rated - This model is Energy Star-qualified for budget-friendly and energy-saving operation. Manufacturer-Suggested Room Size	800 sq. ft. Practical Room Size 800 sq. ft.
Power Cord Length	6.5 ft.